The new IPI 360 LIVE BROADCAST platform is ready to make its next appearance! 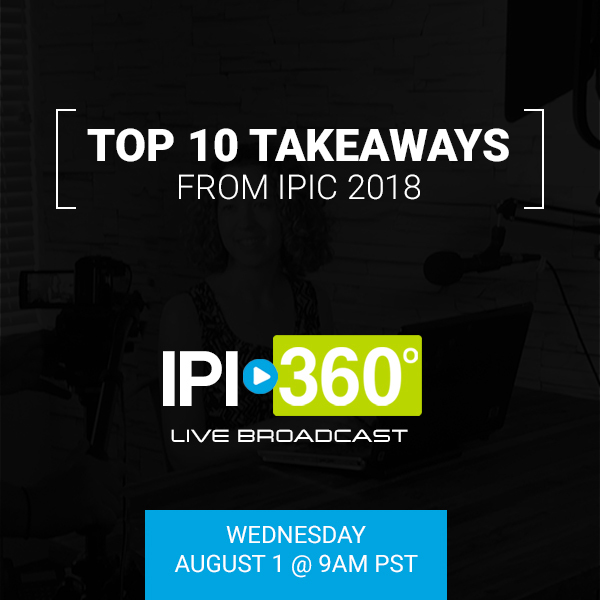 Join us for the next IPI 360 LIVE BROADCAST: Top 10 Takeaways from IPIC! Where: Live online! Click this link https://www.ipiphoto.com/page/IPI306LIVEBroadcast to join the event during the time frame listed above. THAT’S IT! You don’t have to register, you don’t have to sign up for anything, you just have to sit back, relax and maybe take a note or two. Logging in to www.ipiphoto.com and selecting the IPI 360 LIVE BROADCAST web banner also works to get you in! All broadcasts will be recorded and stored on the IPI 360 LIVE BROADCAST page. We are all set to bring you another LIVE BROADCAST episode to your computer screens. And the topic this time? Our Top Ten Takeaways from IPIC 2018. See what you might have missed as we share our favorite BOLD moments from IPIC 2018! Discover key business growth opportunities along with highlights from our Live Learning Sessions, Trade Show and Boot Camps! And for those of you that were unable to make it this year, this is your chance to gather all the vital information in one place! We’ll give you all the dets on everything you may have missed such as University Sessions, MSP DVD distribution, downloadable resources, IPIC 2018 Portal, IPIC excursions and, well, I could go on forever. Join us, chat with us, even raise the roof with us during this fast-paced must-follow news broadcast! You may have come to watch us for the information but you’ll end up staying for our dance moves. See you there!